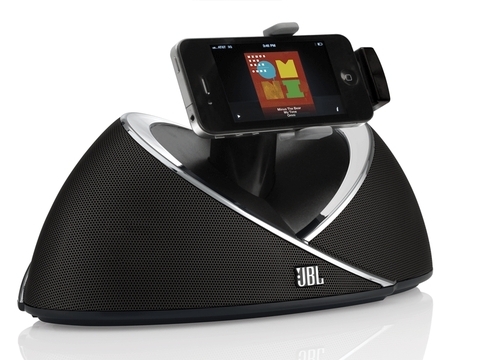 JBL’s latest speaker dock, the OnBeat, has the rare distinction of being compatible with iPods, iPhones and iPads. Shipping with a range of docking clamps, any of the Apple media devices will work with the dock, while a 3.5mm aux-in connection will let you play about with other PMPs too. Elsewhere there’s a USB connection for syncing with your iTunes library, as well as composite video output for displaying content on a big screen. The stereo speakers themselves are 7.5 watt numbers, with plenty of DSP tech fine-tuning the outputted sound. “Imagine what moviegoers must have felt when they heard sound paired with film for the first time in history. This is what we hope to accomplish for the next era of entertainment experiences with products such as the JBL OnBeat for the iPad, iPhone and more,” said David Slump, president of the HARMAN Consumer Division, the umbrella company under which JBL reside. Due out in April, click here for some more info.